Many wavelet shrinkage methods assume that the data are observed on an equally spaced grid of length of the form 2 J for some J. These methods require serious modification or preprocessed data to cope with irregularly spaced data. The lifting scheme is a recent mathematical innovation that obtains a multiscale analysis for irregularly spaced data. A key lifting component is the “predict” step where a prediction of a data point is made. The residual from the prediction is stored and can be thought of as a wavelet coefficient. This article exploits the flexibility of lifting by adaptively choosing the kind of prediction according to a criterion. In this way the smoothness of the underlying ‘wavelet’ can be adapted to the local properties of the function. Multiple observations at a point can readily be handled by lifting through a suitable choice of prediction. We adapt existing shrinkage rules to work with our adaptive lifting methods. 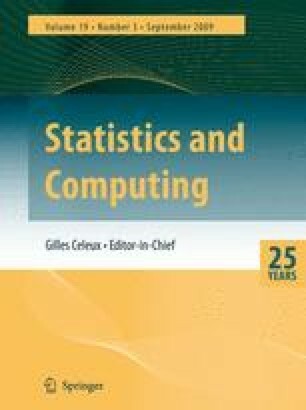 We use simulation to demonstrate the improved sparsity of our techniques and improved regression performance when compared to both wavelet and non-wavelet methods suitable for irregular data. We also exhibit the benefits of our adaptive lifting on the real inductance plethysmography and motorcycle data.